We worked incredibly hard to get to where we did. I'm really proud of this team and what we were able to accomplish. 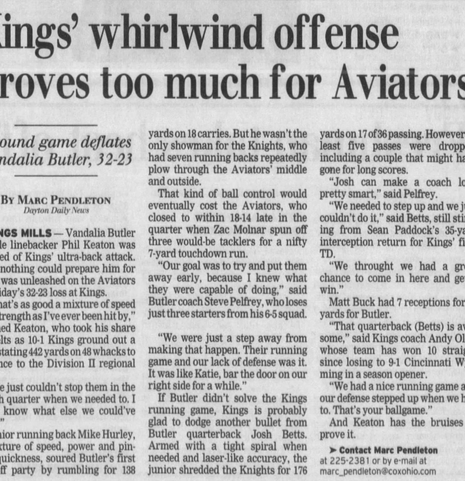 The 1999 marked a first in the long history of Butler football, as the Aviators earned their first ever playoff berth with a regular season mark of 6-4.0. Butler would ultimately fall in their first ever Week 11 game to Kings by a score of 32-23, finishing the season at 6-5. It would be the first of five consecutive trips to the playoffs for Butler, and the beginning of the "Golden Era" in Aviators football lore. "The support was phenomenal," coach Steve Pelfrey said. "I really believe that our success was based in large part in the support that we got from our students and staff." Team captain James Kaylor concurred, "It was amazing to see all of those faces up in the stands," said Kaylor. "The whole team appreciated the support we got from our friends and peers." Overflow crowds witnessed an impressive turnaround in Butler football each Friday night. 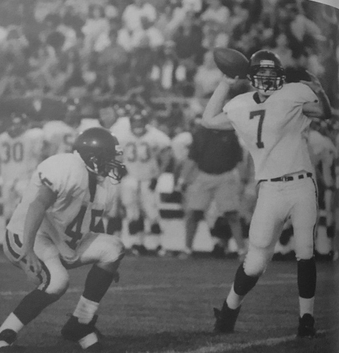 It was also when a burgeoning young quarterback by the name of Josh Betts began to make a name for himself. The junior quarterback was named Second Team GMVC, First Team All-Southwestern District and Honorable Mention on the All-Ohio Team. 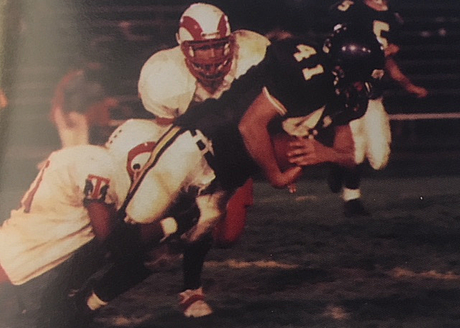 Butler also had a punishing ground attack led by fellow junior Zac Molnar who finished the season with 1,045 yards on 92 carries and nine touchdowns.